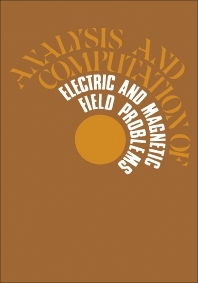 Analysis and Computation of Electric and Magnetic Field Problems, Second Edition is a comprehensive treatment of both analytical and numerical methods for the derivation of two-dimensional static and quasi-static electric and magnetic fields. The essence of each method of solution is emphasized and the scopes of the different methods are described, with particular regard to the influence of digital computers. This book is comprised of 12 chapters and begins with an introduction to the fundamental theory of electric and magnetic fields. The derivation of quantities of physical interest such as force, inductance, and capacitance from the field solution is explained. The next section deals with the methods of images and separation of variables and presents direct solutions of Laplace's equation and of Poisson's equation. The basic solutions are developed rigorously from considerations of surface charges and are expressed in complex variable form. Subsequent chapters discuss transformation methods as well as line and doublet sources; the transformation of regions exterior to finite boundaries; and the powerful numerical methods used to enlarge the scope of conformal transformation. The last section is devoted to finite difference methods and the Monte Carlo method, along with all classes of boundary shape and condition. This monograph is intended primarily for engineers, physicists, and mathematicians, as well as degree students towards the end of their courses.